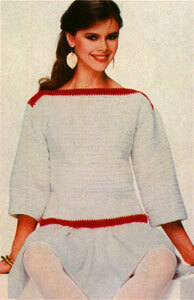 Perfect for transitional dressing, this white T-Shirt looks especially crisp with the red crocheted borders. Boat-neck and mid-arm sleeves are nice details that make this a natural for late summer, early fall dressing. What you might not notice is that the shaping is simple--there is no increasing and decreasing. The instructions are written for size 6-8. Changes for sizes 10-12 and 14-16 are in parentheses. 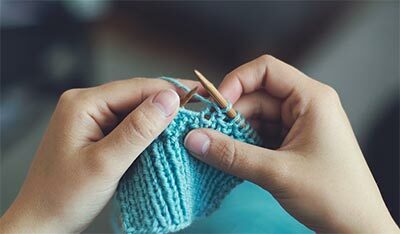 In double crochet, measuring across: 14-1/2 stitches = 4"
top to bottom: 7-1/2 rows= 4"
Length of back and front: 17-1/2 (18-1/2, 19-1/2)"
Length from bottom to underarm: 11 (11-1/2, 12)"
Depth of armhole: 6-1/2 (7, 7-1/2)"
Using contrasting yarn color, chain 55 (59, 63). This row is on the right side of the work. Work 1 single crochet in the second chain from the hook and 1 single crochet in each remaining chain. You will now have 54 (58, 62) stitches. Repeat Step 3 twice. You now have completed four rows. Cut yarn. Attach main color of yarn through chain of last stitch. Chain 2 and turn work around. Work 1 double crochet in each single crochet. Chain 2 and turn work around. Work 1 double crochet in each double crochet. Continue to repeat Step 6 until your piece measures 11 (11-1/2, 12)" from the beginning. Tie a short piece of yarn to the top of the first and last stitches of this row to form a marker for the bottom of the armhole. Continue to repeat Step 6 until your piece measures 20 (20-1/2, 21)" from the beginning. Cut yarn. Attach contrasting yarn color through chain of last stitch. Chain 1 and turn work around. Work 1 single crochet in each double crochet. Chain 1 and turn work around. Work 1 single crochet in each single crochet. Continue to repeat Step 10 for 3 more rows, for a total of 5 contrasting rows. Cut yarn. Make a second piece exactly like the back. Make two pieces exactly alike. Using main yarn color, chain 48 (50, 52). This row is on the right side of the work. Work 1 single crochet in the second chain from the hook and 1 single crochet in each remaining chain. You now have 47 (49, 51) stitches. Repeat Step 3 twice. You now have a total of 4 single crochet rows. Chain 2 and turn work around. 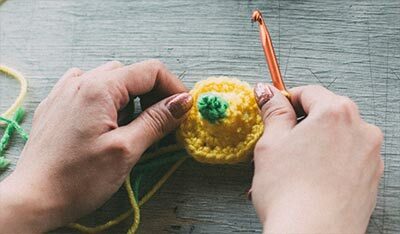 Work 1 double crochet in each single crochet. Continue to repeat Step 6 until piece measures 12-1/2 (13, 13-1/2)" from the beginning. Cut yarn. Pin front to back at shoulders, with right sides together. Using contrasting yarn, start at one outside and sew together for 3". End off and conceal end of sewing yarn, weaving it around stitches on the wrong side of the sweater. Repeat sewing on other shoulder. Pin sides of front and back together between bottom and armhole markers. Using main yarn color, sew each side seam from marker to bottom. Fold sleeve in half lengthwise with right side inside. Using matching yarn, sew underarm seams from bottom to top. Pin top edge of sleeve into armhole, matching underarm sleeve and side seams. Sew armhole.